[Abstract] The aim of this paper is to examine the overseas experience in tackling youth unemployment problem, as to rethink policy direction of Hong Kong. According to the micro-level human capital theory, the lack of skills and knowledge for employment is the main cause of youth unemployment, so the key solution is to provide youth training schemes. However, many researches conclude that, in the long term, these training schemes cannot increase employment rate and income level of the unemployed youth. The macro-level perspective provides in-depth analysis, but cannot suggest any practical solution. The meso-level perspective, which focuses on the weakening of social capital of the youth, provides new theoretical insight and practical direction for youth employment. Hong Kong should learn that youth in poor communities have great social capital that needs to be nurtured and enhanced so as to facilitate the interaction of supply and demand of youth in the labour market. [Abstract] Hong Kong has entered the "post-industrial" era. Added to the challenges brought by economic restructuring is the recent economic downturn, which aggravates youth unemployment problems. Various vocational training opportunities have long been available to help young school leavers. Nevertheless, we need to discover the missing link between the employment market and young people in order to provide the best solution. This paper reviews various schemes currently available, particularly analyzing how a new youth training scheme, the Youth Pre-employment Training Programme, founded on an enormous network comprising training courses, counseling and hands-on practices, could enhance young people's competitiveness and means of development at difficult times. [Abstract] Continuing education provides an avenue to increase and maintain competitiveness of individuals within the context of economic globalization. During the past decade, many people in Hong Kong have substantially raised their education attainment, including at degree level and beyond, through continuing education. The Government proposed to increase the participation rate of post-secondary education of the relevant age group to 60% within the next ten years in response to the structural change of the economy to a knowledge-based one. It is expected the increase will be from the Associate Degree sector, which has been introduced in Hong Kong in 2000. A common set of descriptors for the Associate Degree has been agreed upon and the Government has taken the lead in recognizing its value for employment purposes, while recognition by the private sector it is estimated to be a gradual process. [Abstract] The Government, the private sector and the non-governmental organizations should work together by playing an active role in order to solve the youth employment problem. In discussing the careers and guidance support services provided by the Hong Kong Federation of Youth Groups, this article portrays how a non-government organization can play its role in improving the situation by propelling the interaction among the Government, the private sector and the non-governmental agencies. [Abstract] This article emphasized that helping young people in their career development is an important task for youth workers and educators. This article examines three career development theories, and proposes a number of career intervention strategies and procedures based on these theories, to help young people plan their lives and careers. In the last section, this article also discusses a number of trends related to youth employment, as our economy becomes more global in the information age. [Abstract] Due to the worsening employment problem in Hong Kong and the speedy development of the economy of China, Hong Kong youth seems to be more likely to work in Mainland China. The major obstacle preventing them from doing so are their misunderstanding of Mainland’s realities, and the alienation developed thereafter. The open-door policy of China has stepped into a totally new stage. Working on the Mainland should not be considered a second choice, but rather as an aggressive action in searching for more opportunities and upgrading standards. Should Hong Kong youth work on the Mainland, they should devote themselves to their careers, understand local social systems, and develop wider interpersonal relationships. [Abstract] Family education is the starting point for nurturing the qualities, skills and talents of young people so as to develop a comprehensive and solid human resource pool in Hong Kong. The education one receives in family milieu has a crucial influence on such development. Given the estimation over the environmental development, both inside and outside Hong Kong, and the new political environment after Hong Kong's unification with China, teenagers need to nurture their ideals, values, knowledge and skills. Education should emphasize more on the development of morals, wisdom, sports, sociability and aesthetics, and nurture the ability of students to think independently and to become citizens with social issues concerns. [Abstract] The youth unemployment problem is getting more serious and has become one of the main problems that our Government needs to resolve. Employment not only provides youth with finance, but it is also a sign of social recognition. Being employed is a basic right of the youth, so our society should take responsibility to protect their work opportunities. In this paper, we will look into the relationship between youth’s right to be employed and the role our society should play in protecting this right. We will also discuss suggestions that have been made with regard to the improvement of the existing measures in order to tackle the problem. Such suggestions refer to developing community economy, or introducing Colleges of higher education geared on subjects focusing on skills and knowledge that facilitate employment. We believe that the youth unemployment problem can be alleviated successfully through a strategic execution of such measures. [Abstract] The Faculty of Science and Engineering at City University of Hong Kong is running an Industrial Attachment Scheme in 2002 with the support of 63 industrial partners benefiting 238 students from 6 participating Departments. The majority of these Year II students will be deployed for a 9-week industrial training, this summer, to business establishments in Pearl River Delta Region. This paper presents the background, objectives, and salient features of this Industrial Attachment Scheme. [Abstract] The Education Reform emphasizes on the lifelong learning opportunities enabling a holistic development of the person. The Summer Work Experience Scheme provides for learning in contexts that cannot be offered during classroom tailored learning. The Hong Kong Association of Careers Masters and Guidance Masters, together with the Education Department, has organized the Summer Work Experience Scheme for the past 27 years. It allows Secondary 5 students to work in different organizations during the summer. Students find it an eye-opening opportunity to understand various work related issues. [Abstract] The development of youth human resources is of great significance in the current drive for the development of the economy. 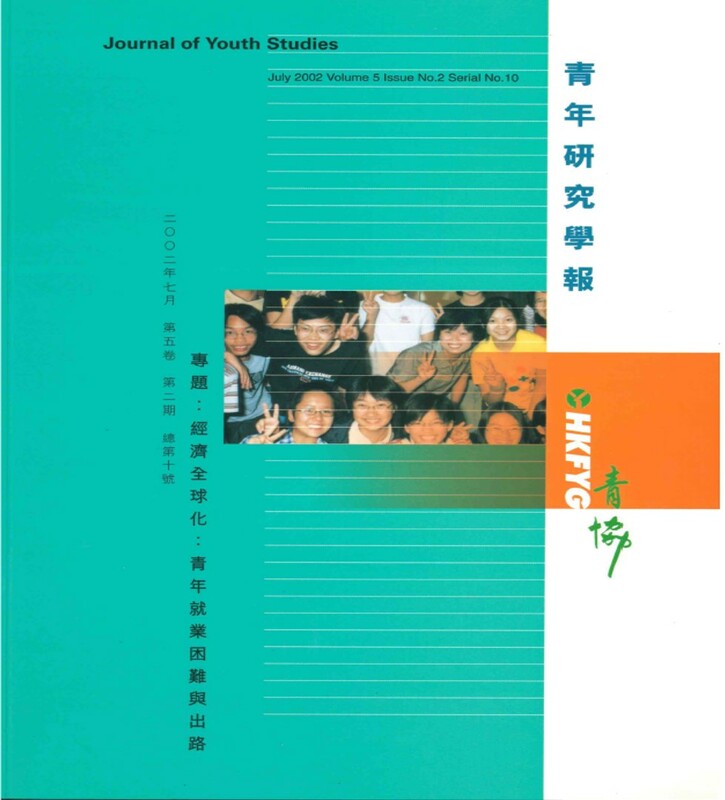 This thesis discusses the unique value of youth human resources, illustrating the relevant measures taken on Mainland China. [Abstract] Since 2000, Taiwan's unemployment rate has continually increased, especially among first-time job seekers (mostly youths). To evaluate the social causes of Taiwan's unemployment, this article analyzes Taiwan's labor force and the labor force participation rate as determined by industrial restructuring and the supply and demand of human capital. The article also presents Governmental and Non-Governmental strategies that successfully improve human capital development among college graduates that face unemployment. [Abstract] Youth represents a tremendous potential development of human capital which society cannot afford to neglect. The impact of globalization has been felt and demands a concrete response. This response includes strengthening the social fabric, restructuring the local economy and gearing up human resources to meet the challenges of our global world. Although unemployment has increased due to recession, many of the youths are technically not unemployed. More youths are economically inactive and enrolled in schools or vocational training. The new economy mentality requires innovation, training, reinventing education, and entrepreneurship that significantly favours youth. Largely, the response of Singapore to the economic downturn and unemployment is rightly developmental and preventive in nature. While this provides a longer-term solution, more immediate measures are necessary to deal with the many people affected by recession. It is in empowering and integrating youths, as well as harnessing their creative potentials and resources, that lays the hope for forging new frontiers of human civilization. [Abstract] It is a persistent strategy that the Government of Macao Special Administrative Region undertakes efforts for developing youth human resources that aim at building long-term foundation for Macanese society. The development of youth should concentrate on education and assistance by vocational training. In concert with a good social environment, youth will be able to exercise their strengths, talents and skills. The government has also set up policies in tackling youth employment problems by providing allowances to companies that employ young people with no previous work experience. [Abstract] Hong Kong has been undergoing a rapid economic restructuring since 1997-98. While youth are facing an unstable economy and society, their unemployment rate is particularly high. Different sectors of society are concerned about the weakening competitiveness of Hong Kong youth. The Government is also trying to tackle the problem by providing resources in this respect. Nevertheless, little effect can be noted. To improve the situation, youth should make efforts to know about the international society and to increase their understanding in conceptual and intellectual thinkings, in addition to consolidating their basic technical skills. The Government, commercial sector, youth organizations and the educational sector should also work together in propagating a suitable atmosphere for the development of youth employment. [Abstract] As our economy is moving towards a knowledge-based post-industrial era, graduates need to re-equip themselves to meet with rapidly changing expectations of employers and society. A study was launched to gain insight into the expectations and aspirations of graduating class students on their prospective jobs. Findings reveal concern with issues such as securing a job, preference for potential jobs, while salary and job prospects were also analyzed. As China is a member of the WTO, Hong Kong students need to widen their exposure and enhance their practical work experiences through workplace education and placement in both local and Mainland companies. In addition, vocational education institutions also need to provide to students a seamless learning experience and enhance their lifelong learning abilities. [Abstract] In recent years, the proportion of shoplifting crimes committed by children in relation to the total of shoplifting crimes accounts for around thirty percent annually. Despite the fact that there have been a number of recent studies on delinquency, little has been done in exploring the underlying reasons and process of shoplifting behavior among children in Hong Kong. This paper describes a qualitative study based on interviewing 20 shoplifters aged 8 to 12. Results suggest that a large proportion of respondents are not rational criminals. Most respondents had not calculated the cost/benefit of their illegal behavior before committing the act. It is found, however, that around 35% of respondents may be considered as rational criminals. Children's shoplifting behavior is best explained by a mixed criminological approach, which incorporates Social Control, Differential Association, Rational Choice and Routine Activity Theories. [Abstract] Singapore 21: Together, We Make the Difference" is the vision of Singapore in the 21st century. It is not considered to be a blueprint for the future, but rather a compass to guide all Singaporeans through the challenges of the 21st century. However, the Chinese version and the English version of Singapore 21 clearly differ in semantic content. This paper estimates the level of risk-taking and level of overconfidence of 222 Singaporean undergraduate students, so as to test whether the two parallel versions of S21 would function similarly in influencing individual decision-making. The overall results show that both Chinese and English versions could advocate weaker overconfidence, both Chinese and English versions give neutral risk-taking advice, and that there is no significant difference between the two versions in influencing individual’s levels of risk-taking and overconfidence. [Abstract] Although Hong Kong is a wealthy society in physical terms, spiritual life seems to be hollow. Many people lack physical activities that may lead to over-nutrition and diminishing of health. Parents tend to protect or even spoil their only child. In addition, research conducted in Hong Kong concluded that health education is not considered important in schools and the society at large. Consequently, children, adolescents and adults were found at risk with regard to physical and spiritual health. Schools should be responsible for maintaining and promoting the healthy life of students, since they are the most important and efficient places for learning. In this respect, the author undertakes a concentrated effort in promoting health education in her school. Health education should include school policy, school environment, education content, health services, health skills training, interpersonal relationships, school spirit, community connections, family-school cooperation, etc.